The players take on the roles of the energetic adventurers who sought their fortunes in Macao. Whether as captain or governor, as craftsman or scholar, numerous exciting functions are offered the players. Who will use his various possible actions the wisest? Who will have the best plan and can acquire the most prestige by the end of the game? In hobbyist circles there seems to be a constant dialog around theme and game mechanics. Some feel that a great board game – by definition – must be organized around an immersive theme. Others feel that this isn’t a necessary component, and that being tied to a theme can limit a designer’s freedom to develop innovative mechanics. For my part, though I think it is true that emphasizing a strong theme necessarily places limits on the otherwise abstract elements of game design, strong mechanics are still possible when placed in the hands of a cable designer – Vlaada Chvátil who designed Galaxy Trucker and Mage Knight comes to mind. That being said, there’s nothing wrong with freeing oneself from the trappings of a strong theme, and placing most of the focus on great mechanics, which is what the designer of Macao – Stefan Feld – usually does. To be sure, the immersion factor is still there, but it rests in the “machine” rather than the theme, which is what fans of the classic euro most enjoy anyway. Will you feel like a 17th century adventurer seeking his fortune in the ancient near east trading city of Macao? Not so much. The components are of decent quality. You get a quality (thick) game board. The player-specific components, though of thinner-than-I’d-prefer card stock, seem to be holding up well. The little colored wooden cubes are something my wife particularly likes. Finally, the game uses hobbit cards, which would really be annoying but for the fact that there’s no hand management (holding of cards in your hand) needed. The artwork is what you’d expect, effectively casting a veneer of generic theme that elevates the enjoyment of the game above what it would be for a pure abstract without distracting from the interesting mechanics. In the game you’ll be rolling dice to determine the resources (cubes) to be used for the current turn as well as turns to come. Five dice of various colors will be rolled, and each player will have an opportunity to pick two of those dice to translate into the number and color of cubes to be distributed on a “wind rose”, a nifty devise which determines the resources a player will have in a given round. 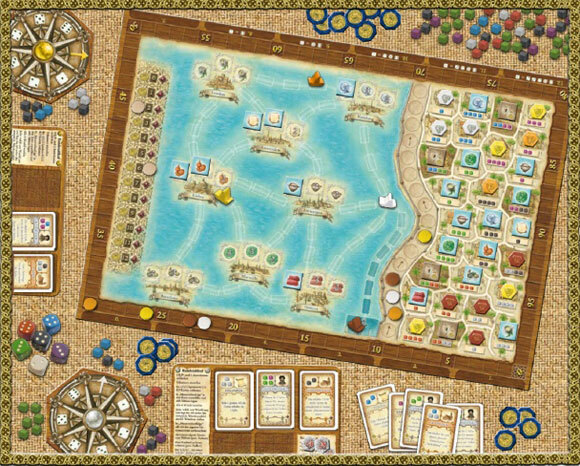 The actions one can take are varied…they include, 1) Activating People, Building, and Office cards (drafted into your tableau at the beginning of each round) that – depending on the type – have various effects throughout the game, 2) purchasing goods tiles from the main board that can later be sold at various ports, 3) Moving your ship on the main board to reach those aforementioned ports, 4) Moving your player marker on the “Wall” to either obtain or maintain first player status, and 4) Using activated cards to trade in cubes for different colored cubes, or to buy gold which can be used later to buy victory points. The only action where cubes are not used to do something is the actual buying of victory points with gold coins, the exchange rate for which is determined by the initial offering of cards at the beginning of each round. Whew! There is luck involved in what cards will be in the offering at the beginning of each round, and the player that is ahead on the “Wall” will have first pick of that offering. This is a big advantage in the sense that it makes it easier for the first player to pursue and, perhaps, stick to a specific strategy early in the game. However, even if the first player remains the first player, there are counter-strategies to whatever strategy is being pursued, so it’s not necessary to get into a “wall war”. Obviously there is also luck involved with those dice rolls, but it doesn’t effectively sway the game in any decisive way since the players are drawing from the same pool and have significant control over how those cubes are allocated to their individual wind rose. Though one’s way of playing will be somewhat directed by the cards drafted, there remains enough choices for deep strategies to emerge after multiple plays. On the first play, one may find the number of choices (and paths to victory) overwhelming, so it starts off as feeling like a heavy game, and that feeling of “I don’t know what I’m doing” will be there. However, the first play won’t be a write-off. By the end it will have its hooks in you, and you’ll want another go at it. The second game is much more enjoyable and you’ll start pursuing specific strategies, avoiding the big mistakes that came out of the first experience. One of the fun aspects is the opportunity for great combination moves with the cards that are activated, whose abilities can be used once per turn. Pulling off great moves, especially later in the game when there are more resources, is rewarding. The mechanic of rolling dice to determine the type (color)/qty of resources and even the round on which they’ll be used, is unique and enjoyable. Like many Stefan Feld games, the balance struck among the many things to do lead to multiple paths to victory. Exploring those paths is great fun. The planning out of your wind rose and taking of actions, with the given dice rolls and myriad choices before you, can lead to indecisiveness. It’s not really a problem for a 2 player game, but it may make a 4 player game drag on. Some of the cards are considerably more powerful than others, though this aspect is somewhat mitigated by the difficult combination of cubes needed to activate them. Macao takes place in the 17th century when the small island off the coast of China was the largest trading center in the far east. Players take the role of an influential Portuguese adventurer risking investment in the trading activities of Macao. The theme is not well represented in the game but some mechanics do fit the theme. The object of the game is to make lucrative trade deals, expand influence in the city, and fill important offices and positions to score the most Prestige Points (PP). Macao plays with 2 to 4 players, however; I would recommend this game for 3 or 4 players. The components are nice. The board is mounted on thin cardboard and colorful. There are thin cardboard chits & player mats, wood dice, and wood playing pieces including cubes and pieces in the shape of a ship. The marginally durable cards are small size with average artwork reminiscent of 17th century Europe. The rulebook is only 8 pages, fairly well written and organized, and contains many examples of play. Set-up for Macao is easy and fairly quick. Each player receives 5 gold, and a tableau, wind rose, and ownership markers of his color. Each player places his ship, player order disc and scoring disc on the board. One Goods Tile is placed on each of the 24 city spaces on the board and the 6 joker tiles are placed on the dark city spaces. The 24 Office Cards are shuffled and placed face up in sets of two along the edge of the board in the slots provided. Lastly the 96 Building/Person Cards are shuffled and placed face down in a stack near the board. 1.1 Four Building/Person Cards are drawn and added to the two Office Cards for the Round. 1.2 The tribute value for the Round is determined according to the numbers on the bottom of the cards and marked on the Tribute Table located on the left hand side of the board. 1.3 Building/Person Cards are discarded depending on the number of players. Zero cards are discarded for 4 players, 1 card for 3 players and 2 cards for 2 players. 1.4 The players in turn order choose one of the available cards and place it on their tableau. The tableau only has room for 5 cards. Players receive a Punishment Marker (-3 Prestige Points) if there is no room on his tableau for a newly drawn card. 2.1 The 6 D6 dice are rolled. There is a blue, green, red, purple, gray and black die. 2.2 Each player in turn order picks 2 dice (not taking them) and places the indicated number of Action Cubes in the corresponding space on his Wind Rose. For example: The player picks the red die which shows 2 pips and the blue die which shows 6 pips. The player takes 2 red Action Cubes and 6 blue Action Cubes, and places them in the 2 space and 6 space on the Wind Rose, respectively. 2.3 After all players have selected their Action Cubes, they rotate their Wind Rose 1 space. If after rotating the Wind Rose, the arrow points to a space with no Action Cubes, then the player receives a Punishment Marker. a. Activate Cards- Cards on the tableau are Activated by paying the Action Cube cost shown in the upper left hand corner of the Office/Building/Person Cards. A player can Activate as many cards on his tableau as he wishes. Once Activated, the card is removed from the tableau and placed in front of the player. b. Obtain a City Quarter- Once per Round, a player can take possession of a city quarter by paying the indicated Action Cube cost on the board. The player replaces the Goods Tile in the city quarter with an ownership marker and then places the Goods Tile on his ship (tableau). c. Move Further on the Wall-A player can spend Action Cubes to move his turn order disc along the city wall on the board. The player furthest along the wall goes first on the next Round. d. Move Ship- A player spends 1 Action Cube per each sea space he wants to move his ship. Players move their ships to ports and sell any goods for PP. e. Acquire Prestige Points-Once per Round, a player can spend gold to buy PP according to the Tribute Table. f. Use Cards-A player can use the function of any Activated cards in front of him. Cards can only be used once per Round unless otherwise indicated. g. Pass-When a player cannot or chooses not to perform further actions in a turn, then he must pass. Any remaining Action Cubes are discarded to the supply. When the 12th Round is completed, PPs are then tallied to determine a winner. All players take a Punishment Marker for Each card remaining on their tableau. Activated cards and each player’s longest city quarter string are scored. The winner is the player with the most PPs. Macao is easy to learn but takes a few plays to master the strategies. I consider Macao a heavy game and would not recommend it to casual gamers. Overall the game has a good blend of several mechanics that work well with one another. The Wind Rose is a very unique and interesting mechanic. And like many games with cards, Macao has its share of powerful card combos which players must look for either to obtain or deny other players. Similar to most Euros, player interaction is minimal. Players jockey for turn order on the wall, can grab a card or city quarter before you, or sell a good at a port before you, but that is the extent of interaction. The one aspect of play I do not like is the Punishment Markers. I’m OK with assigning Punishment Markers for each unused card at the end of the game. However, I feel that getting a marker when your tableau is full or your Wind Rose is empty is harsh. If these events occur it means you are already struggling with the game and the punishment markers exasperate your situation. It makes this game very unforgiving. Game time is about 2 hours, but because you are very much engaged in the game, it goes by quick. Despite the punishment Marker issue, Macao is a very good game and would be a nice addition to your game collection. I’ve never been a guy who enjoyed games involving resources. It just wasn’t my thing. Didn’t care if it was money, wood, prestige, followers, sheep or cucumbers – I didn’t want to find it, mine it, trade it, sell it or anything of the like. For whatever reason, that kind of play just didn’t trigger anything in me. So then why do I love Macao? It’s all about resources. It even has the ultimate in resource cliches – little wooden cubes. The theme, shipping stuff around the Mediterranean sea, is standard fare. (Side note: Holy distorted map there kiddies.) No, that didn’t make the difference. What makes the difference, I suspect, is that Macao uses an outstanding game mechanic for determining which resources are available, how much of them is available and most critically, when they will be available. All players have equal access to the cubes. Dice are rolled each round, but the rolls impact all the players equally. The aspects that I like least about resource games, hoarding and haggling, are not in play. This lets me concentrate on the miriad other decisions. Do I take that person, or build that building. Do I buy porcelain in that quarter (because delivering it would be easy), or jade over there (because it extends my chain of properties)? Do I move up the wall so that I’ll have first choice next round, or move my ship out of harbor to get a head start on my deliveries. The learning curve is steep on this game, but it only takes one time through to understand it all. There are many choices to be made during your turn, but those choices are broken up into manageable chunks. The care the designer took to balance the cards really shows. I highly recommend it, even to those of you, like me, who don’t think of yourself as a resource gamer. Despite only having played three of his games (Macao, Castles of Burgundy and Trajan), I’m definitely a Feld fanboy. I also had to spend some time and effort to track down a used copy of Macao (complete with a creepy trip out to an industrial park by the airport to make the transaction like the most nerdy drug transaction ever) so keep that in mind while I gush. I love this game. It’s a bit daunting to jump into, and your first game is probably going to be a bit of a mess, but it really opens up once you know what you’re doing. I love the amount of replayability thanks to the sheer number of cards you have access to. You’ll only see a fraction of them in every game, so it keeps things fresh. I love the central dice/windrose mechanic. Do I go for a big reward in a future turn or for some immediate gratification? Lots of agonizing decisions to make. I love the massive turns you can take towards the end of the game. It’s a great exercise in maximizing the use of your resources. I love that with only 12 rounds the tension ratchets up each turn as you realize that you won’t have enough time (or cubes!) for your clever plan to hatch. It can be a little frustrating when playing with someone who has trouble making decisions (like my primary gaming partner who will agonize over every single decision!) but that just shows me how important each decision you make can be. It’s a solid title, and definitely a favourite in my house. I don’t think it’s a good choice for your first Feld (I think Castles of Burgundy is a better entry level game) but it’s a gem that every Euro loving cube pusher should try out. Assuming you can find a copy! Add a Review for "Macao"